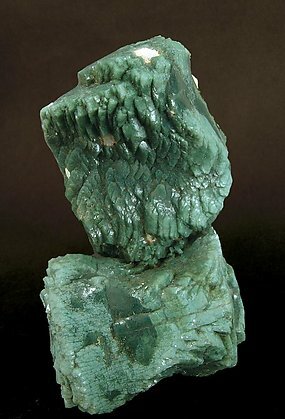 Celadonite is a massive unattractive mineral. The only time one can get good specimens of this species is when it is included in Indian Zeolites, giving them a characteristic green color. In this case it is included in Heulandite-Ca that has more brilliance than is normal, is a floater, has two doubly terminated crystals, and is associated with small balls of white Okenite. Rare and beautiful.